EASTON — Off Route 138 in South Easton, just south of Depot Street, a long driveway veers into dense woods. Lined by tall trees, the quarter-mile roadway ends at a stately wooden building with a large antique sign bearing the name Simpson Spring. Time does, indeed, seem to have stopped in the 19th century at Simpson Spring, one of a dwindling number of independent bottlers of non-alcoholic beverages left in the United States. Inside the sprawling company headquarters and bottling plant is the ancient spring, where in 1878 Frederick Howard began bottling water for sale. Howard had purchased the spring from his wife’s grandfather, blacksmith Samuel Simpson, and he later would produce what was at the time an innovative specialty drink: carbonated soda. Simpson Spring still makes classic sodas in flavors that evoke an earlier time, including sarsaparilla, white birch, and a dazzlingly green lemon-lime. The Simpson Spring building, made of sturdy Georgia pine, is little changed from Frederick Howard’s day. Owners James and Christine Bertarelli are committed to preserving the company’s heritage — maintaining the old bottling plant, using thick, reusable glass bottles, mixing soda flavors by hand in small batches. “We basically follow the recipes that were developed long, long ago,’’ said James Bertarelli, who oversees the business. “We truly pride ourselves in using the highest grade of flavorings. Our orange soda has real orange in it, plus we use pure spring water for the soda.’’ The company also sells bottled spring water in various sizes, from single servings to 5-gallon jugs delivered to home or office. Customers can bring their own jugs and fill them by hand for 25 cents a gallon. The Bertarellis believe Simpson Spring to be the country’s oldest independent bottler operating continually in the same location. The company has survived changing tastes, public worries about sugar consumption, bottle-redemption bills, and the relentless march of global giants Coke and Pepsi, which came to dominate the soft-drink industry several decades ago. In the early part of the 20th century, Simpson Spring was one of the largest beverage companies in New England. Under its second owner, the White family, company trucks delivered soda throughout the Northeast, and Simpson Spring had a substantial account with the Macy’s department store in New York City. When Coca-Cola and Pepsi took off in the second half of the 20th century, Simpson Spring was forced to scale back operations, but the company never surrendered completely. 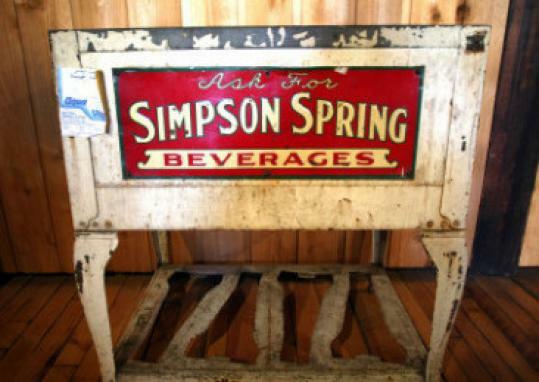 Simpson Spring did make one big concession: It stopped making cola. “We finally said, ‘Let’s let that market be in the hands of Coke and Pepsi,’ ’’ James Bertarelli said. Today, the company has 12 employees, including assembly-line workers, shippers, and drivers. According to the company, its annual sales of soda are between 3,500 and 4,000 cases, made in batches of 100 cases as needed. In winter months, sales of bottled water are between 500 and 1,000 gallons daily, and the figures double or triple in summer, Christine Bertarelli said. Simpson Spring products are not found in stores everywhere. The company targets distribution to specialty grocers, independent stores, small restaurants, and bakeries. According to the Bertarellis, local Simpson Spring outlets include Andrews Bakery & Cafe in Easton, White’s Cafe and Pastry Shop and the Italian Kitchen in Brockton, Eagle Farms in Milton, and Foodie’s Urban Market in Boston’s South End. The Easton plant also houses a company store, which sells the soda and water produced at the facility, and bottles its water under private labels for businesses. It has loyal followers, some of whom live far from Easton, and the Bertarellis try to accommodate them. James said that once when he was in New York City, he personally delivered a case of soda to a hotel where a fan who was desperate for Simpson Spring soda was staying. “If they want the soda, we’ll find a way to get it to them,’’ he said. The Bertarellis, who are from Brockton, bought Simpson Spring and its 50-acre property in 1989 from the White family. They also own a 140-acre farm next to Simpson Spring. “When we heard that this was for sale, we thought it would be a nice purchase, ’’ said James, whose late father, William Bertarelli, and uncle, Paul Bertarelli, were also involved in the acquisition. The previous owner, Edward White, stayed on for a month to teach the Bertarellis the business. “I had a crash course in how to make soda,’’ said James. The Bertarelli family has lovingly preserved the business. Many rooms in the bottling plant are virtually unchanged from decades ago. A 1930s-era laboratory, where the company’s chemists developed the concoctions, is a miniature museum and library where old bottles, company records, and newspaper clippings are displayed or stored. The actual spring is housed in an elegant tiled room built in approximately the 1920s. Old equipment, including bottling, mixing, and labeling devices, are on display in another large room. The Bertarelli family still operates the adjacent farm, which produces hay and corn. James Bertarelli said that although the land for the farm and bottling operation would be valuable for other uses, the family is not interested in selling. “Our true, true hope, and my strong desire, is to preserve this property. It’s too special. It is a treasure to have a place so beautiful and so pristine and so close to modern civilization,’’ he said. He believes the company’s fortunes have come full circle.